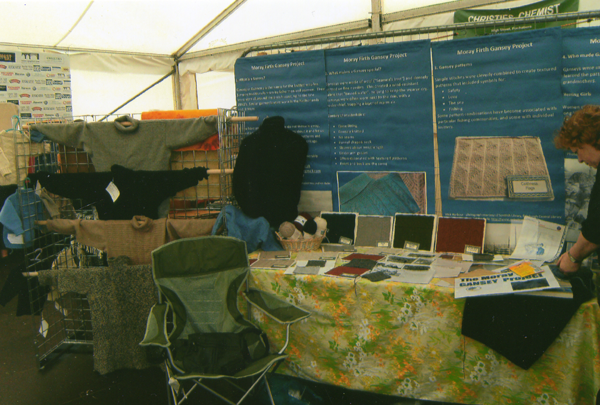 We were very lucky to get a stand at Speyfest (A 4 day folk festival held in Fochabers) at the end of July. 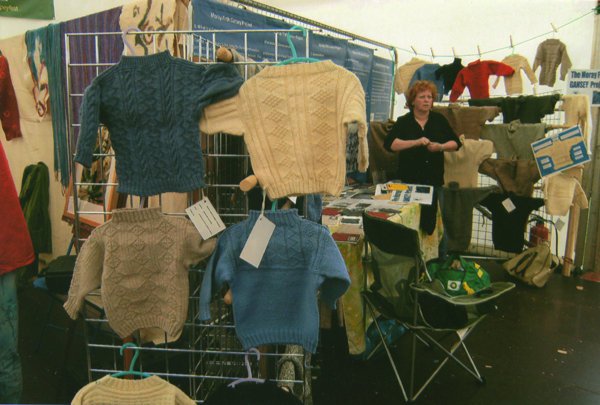 A popular part of the festival is the Craft Fair held on the Saturday. Liz Daniels, the Fair organiser was very interested in the project, and agreed to give us a stand. Edith and I were in attendance throughout the day. The fencing panels, which would be used later on for the concerts, came in very handy for displaying the ganseys. The area we had been given was large, spacious, in a very prominent area at the entrance to the main tent. This was ideal for us to meet people both leaving and entering the tent. Being around 3 miles from the coast, many of the visitors had relatives who knew about ganseys and some knew of the project which was a cheering thought for the future, considering we are in the early stages of the project. We also attracted people who were interested in knitting in general and in helping out with the project. Some of the musicians, who were from all over the country and overseas, took leaflets we had on display and promised to pass them on to friends and acquaintances when they returned home. Our stall was busy throughout the day and Liz informed me that everyone was impressed with the quality and amount of ganseys we had on show. Although the Fair closed at 3.00pm, both Edith and I felt the day had gone very well and we hope to go back next year.